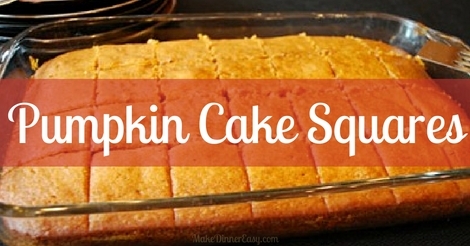 These pumpkin cake squares are one of my go-to Fall dessert recipes. They're super moist and you can make the recipe in one bowl for easy clean-up! I've made these for an after-school snack, for a treat to eat while watching a football game on TV and have even taken it to a Bible Study Breakfast Buffet because what's wrong with eating pumpkin for breakfast! I don't put frosting on these when I make them, but instead top them with a little whipped cream or ice cream. Preheat the oven to 350'F. Combine the wet ingredients with an electric mixer. Combine the dry ingredients in a separate bowl and add to the wet ingredients, mixing well. Pour batter in a greased 9x13x2" glass baking pan and bake at 350'F for 30 minutes or until a toothpick comes out clean. Allow to cool and cut into squares. Serve plain or with whipped cream. *Cook's Notes* I've also used 1 cup of light tasting olive oil instead of canola oil and have also used 1/2 oil and 1/2 unsweetened applesauce and all of these options work great! If you are going to use olive oil, I highly recommend that you use a light tasting olive oil. If you look on the store shelves you will see some bottles that are labeled light tasting and I find this kind of olive oil works just fine for baking!